Dr Stephen Krashen is a leading authority on free voluntary reading (or reading for enjoyment) as a method to acquire language and literacy, and has arguably consolidated the most comprehensive reviews of evidence in this regard. In this article, he addresses the power of free voluntary reading to develop literacy, specifically referring to contexts of poverty. Mark Tomlinson from the Stellenbosch University shares the highly encouraging findings of the impact evaluation of their book-sharing training programme for South African families. 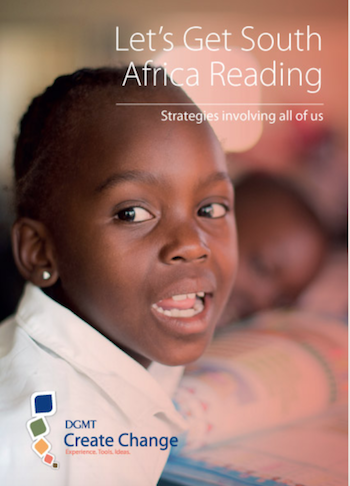 Key strategies, case studies and recommendations to grow a culture of reading in South Africa that all of us can get involved in. 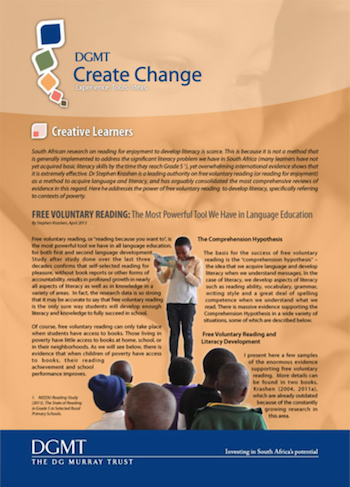 Since the launch of the Legacy Literacy Initiative in 2015, the VW Community Trust and its partners have developed and implemented a comprehensive literacy programme with a strategic goal of ensuring that children in Uitenhage are functionally literate by age 10 or grade 3. The theme in 2017 was “Reading 4 Meaning, the building blocks”. At the conference, the results of the latest survey conducted by Rhodes University onreading ability amongst Grade 3 learners in Uitenhage was shared, examining what has been achieved and assessing what still needs to be done. 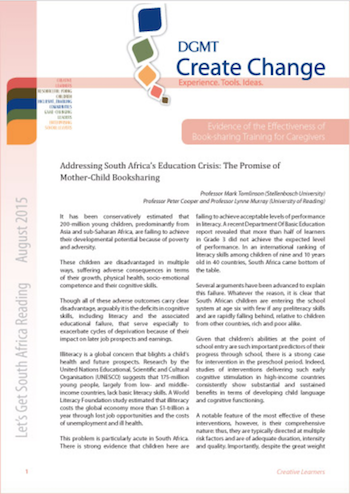 Every child aged between birth and five years should have access to high quality language, literacy and mathematics learning opportunities, which are delivered by skilled ECD practitioners and are available in all early years settings, including the home. Policy Goal: All children must learn to read fluently and with comprehension by the end of Grade 3.